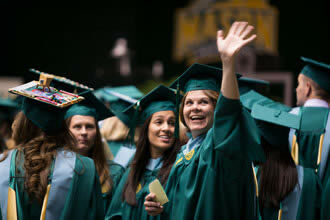 Learn more about earning both a bachelor's and master's degree in as little as five years. Speak to an advisor today. Qualified undergraduates may be admitted to a Bachelor’s/Accelerated Master’ program and obtain both a BA or BS in any degree area and an MS in Educational Psychology concentration within an accelerated time frame. Students meeting the qualifications listed below may be admitted to this program following completion of 90 undergraduate credits. They may then take 12 graduate credits within their senior year (i.e., six credits will partially satisfy requirements of both the BA or BS degree and the MS in Educational Psychology; six credits will be completed as reserve graduate credit toward the Master’s only). If students earn at least 3.0 in these classes, they are granted advanced standing in the master’s program and, upon completion of the bachelor’s degree, must then take an additional 18 credits to earn the master’s degree. After completing 120 credits and all requirements for the BA or BS degree and filing the Graduation Intent Form, students are awarded a bachelor’s degree and admitted to the MS in Educational Psychology, Concentration in Learning, Cognition, and Motivation program. ***Students earning an undergraduate degree in Developmental Psychology may, with Academic Program Coordinator approval, substitute another course for this core requirement.